If you’re a Mac veteran, there’s a pretty good chance that you’re familiar with the names TechTool, Spring Cleaning, Retrospect, and StuffIt. Over the years, some of the basic functions of those apps have made their way into Mac OS X—just enough for you to perform simple operations that keep your Mac in check. TechTool Deluxe is available if you buy AppleCare, Leopard's Time Machine takes care of your backup needs, and Mac OS X handles zipped files natively. But what if you need more than just the basic functions? Smith Micro Software, the company that picked up where Allume—formerly Aladdin Systems—left off, has updated its CheckIt System Performance Suite to version 2. It now includes TechTool Platinum 4.6.2, Spring Cleaning 10, EMC Retrospect Expresss, and StuffIt Standard 2009 in one neat package. With Spring Cleaning you can take the hassle out of managing your files, locate and compare duplicates quickly, and automate these tasks on your own schedule. The venerable TechTool arrives in the Platinum version, which lets you create a bootable DVD, run S.M.A.R.T tests on your hard drives, and maintain your Mac’s performance. Retrospect Express handles your backups while StuffIt, as always, takes care of file compression and expansion. CheckIt 2 also adds ExecutiveSync which lets you synchronize your files between different machines and drives, even between Mac and Windows. 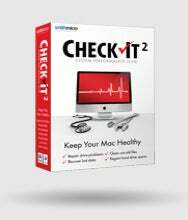 Check it 2 System Performance Suite requires Mac OS X 10.4.11 or later and costs $100.